Today I have continued my...I don't know what to call it really. Not too long ago we rescued a shelf, a baby changing table, a shoe rack and an old wardrobe from being taken to the dump. They all fit our house perfectly, with only small flaws on each one. Now, the wardrobe fell down and broke in pieces, but I managed to save 4 of the boards, with no idea what to do with it. But surprise! With some of these things, I turned our old laundry room into a craft-room/office. It won't be an office until we get a better desk, as Jian is quite tall, and the wardrobe-boards that I flipped upside down and used as a desk, is a bit too low for his comfort. For me it works ok as a temporary solution. 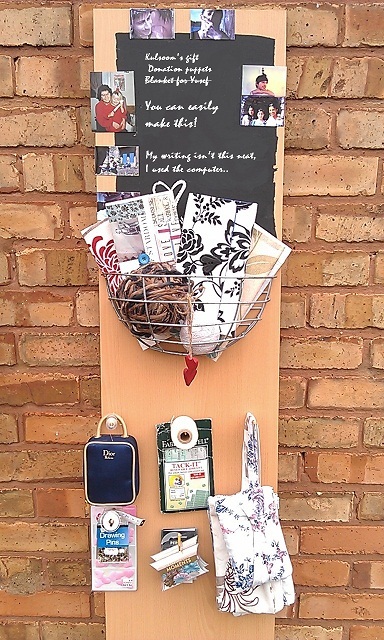 It's better than sewing and whatnot in the livingroom, as my crafting had a tendency to spread all over the place. As always, I digress. Now, the last board from the wardrobe, I turned into this. And I love it! With some chalkboard paint, I made a memo-board for all the things I need to do. An old hanging-basket is perfect for yarn, unfinished projects and what-not. And for hooks, I drilled some holes at the bottom, and forced some paint-brushes in there. Now, this isn't perfect, it clearly has more potential, but for now it's exactly what my tiny room needed. First time using Chalkboard paint? Quick tip: When your layers of paint have dried, take some chalk and cover your surface with it. Otherwise, the first thing you write on your new board will stay there forever. Not only that, but please do notice the improved picture-quality! Brickwall and all. You might think "uh, I've seen way better", and you're very right, but before I pushed those random buttons on my phone, it was way worse, so I'm quite pleased. I'm sure you've seen these cute things all over lately. 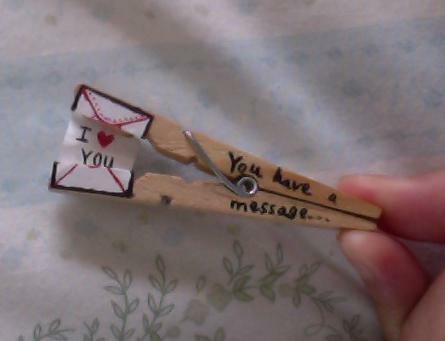 So as a quick and fun friday afternoon project, I found this Clothespin Message Tutorial.